1 E None No Power Seat 1 E is a standard bulkhead Business seat that does not have floor storage during takeoff and landing. 1 F None No Power Seat 1 F is a standard bulkhead Business seat that does not have floor storage during takeoff and landing. 1 J None No Power Seat 1 J is a standard bulkhead Business seat that does not have floor storage during takeoff and landing. 1 K None No Power Seat 1 K is a standard bulkhead Business seat that does not have floor storage during takeoff and landing. 19 B None No Power Seat 19 B is a standard Premium Economy seat. 19 D None No Power Seat 19 D is a standard Premium Economy seat, however, the position of the bassinet and bulkhead may be bothersome. 19 E None No Power Seat 19 E is a standard Premium Economy seat, however, the position of the bassinet and bulkhead may be bothersome. 19 F None No Power Seat 19 F is a standard Premium Economy seat, however, the position of the bassinet and bulkhead may be bothersome. 19 J None No Power Seat 19 J is a standard Premium Economy seat. 19 K None No Power Seat 19 K is a standard Premium Economy seat. 2 A None No Power Seat 2 A is a standard bulkhead Business seat that does not have floor storage during takeoff and landing. 2 B None No Power Seat 2 B is a standard bulkhead Business seat that does not have floor storage during takeoff and landing. 20 A None No Power Seat 20 A is a standard Premium Economy seat. 20 B None No Power Seat 20 B is a standard Premium Economy seat. 20 D None No Power Seat 20 D is a standard Premium Economy seat. 20 E None No Power Seat 20 E is a standard Premium Economy seat. 20 F None No Power Seat 20 F is a standard Premium Economy seat. 20 J None No Power Seat 20 J is a standard Premium Economy seat. 20 K None No Power Seat 20 K is a standard Premium Economy seat. 21 B None No Power Seat 21 B is a standard Premium Economy seat. 21 J None No Power Seat 21 J is a standard Premium Economy seat. 23 A None No Power Seat 23 A is a standard Economy seat, however, the position of the bulkhead may be bothersome. 23 B None No Power Seat 23 B is a standard Economy seat, however, the position of the bulkhead may be bothersome. 23 D None No Power Seat 23 D is a standard Economy seat, however, the position of the bassinet and bulkhead may be bothersome. 23 E None No Power Seat 23 E is a standard Economy seat, however, the position of the bassinet and bulkhead may be bothersome. 23 F None No Power Seat 23 F is a standard Economy seat, however, the position of the bassinet and bulkhead may be bothersome. 23 J None No Power Seat 23 J is a standard Economy seat, however, the position of the bassinet and bulkhead may be bothersome. 23 K None No Power Seat 23 K is a standard Economy seat, however, the position of the bassinet and bulkhead may be bothersome. 24 D None No Power Seat 24 D may have extra legroom. This seat has an immovable armrest. 24 E None No Power Seat 24 E has restricted legroom. This seat has an immovable armrest. 24 F None No Power Seat 24 F has restricted legroom. This seat has an immovable armrest. 24 G None No Power Seat 24 G may have extra legroom. This seat has an immovable armrest. 27 D None No Power Seat 27 D is in the last row of the section. The proximity to the lavatory may be bothersome. 27 E None No Power Seat 27 E is in the last row of the section. The proximity to the lavatory may be bothersome. 27 F None No Power Seat 27 F is in the last row of the section. The proximity to the lavatory may be bothersome. 27 G None No Power Seat 27 G is in the last row of the section. The proximity to the lavatory may be bothersome. 28 A None No Power Seat 28 A is in the last row of the section. The proximity to the lavatory may be bothersome. 28 B None No Power Seat 28 B is in the last row of the section. The proximity to the lavatory may be bothersome. 28 J None No Power Seat 28 J is in the last row of the section. The proximity to the lavatory may be bothersome. 28 K None No Power Seat 28 K is in the last row of the section. The proximity to the lavatory may be bothersome. 29 A None No Power Seat 29 A is designated by Air France as a Preferred Seat that has extra legroom. An extra surcharge must be paid to reserve this seat. The proximity to the lavatory may be bothersome. 29 B None No Power Seat 29 B is designated by Air France as a Preferred Seat that has extra legroom. An extra surcharge must be paid to reserve this seat. The proximity to the lavatory may be bothersome. 29 D None No Power Seat 29 D may have restricted legroom. The position of the bassinet and proximity to the lavatory may be bothersome. 29 E None No Power Seat 29 E may have restricted legroom. The position of the bassinet and proximity to the lavatory may be bothersome. 29 F None No Power Seat 29 F may have restricted legroom. The position of the bassinet and proximity to the lavatory may be bothersome. 29 G None No Power Seat 29 G may have restricted legroom. The position of the bassinet and proximity to the lavatory may be bothersome. 29 J None No Power Seat 29 J is designated by Air France as a Preferred Seat that has extra legroom. An extra surcharge must be paid to reserve this seat. The proximity to the lavatory may be bothersome. 29 K None No Power Seat 29 K is designated by Air France as a Preferred Seat that has extra legroom. An extra surcharge must be paid to reserve this seat. The proximity to the lavatory may be bothersome. 37 D None No Power Seat 37 D is a standard Economy seat, however, other flyers tend to bump into this seat. 37 G None No Power Seat 37 G is a standard Economy seat, however, other flyers tend to bump into this seat. 38 D None No Power Seat 38 D has restricted legroom. 38 E None No Power Seat 38 E has restricted legroom. 38 F None No Power Seat 38 F has restricted legroom. 4 J None No Power Seat 4 J is a standard Business seat, however, the proximity to the galley may be bothersome. 4 K None No Power Seat 4 K is a standard Business seat, however, the proximity to the galley may be bothersome. 41 D None No Power Seat 41 D is in the last row. This seat may have limited recline. 41 E None No Power Seat 41 E is in the last row. This seat may have limited recline. 41 F None No Power Seat 41 F is in the last row. This seat may have limited recline. 42 A None No Power Seat 42 A is in the last row. This seat may have limited recline. 42 B None No Power Seat 42 B is in the last row. This seat may have limited recline. 42 J None No Power Seat 42 J is in the last row. This seat may have limited recline. 42 K None No Power Seat 42 K is in the last row. This seat may have limited recline. 5 A None No Power Seat 5 A is a standard Business seat, however, the proximity to the lavatory may be bothersome. 5 B None No Power Seat 5 B is a standard Business seat, however, the proximity to the lavatory may be bothersome. 5 E None No Power Seat 5 E is a standard Business seat, however, the position of the bassinet and proximity to the lavatory may be bothersome. 5 F None No Power Seat 5 F is a standard Business seat, however, the position of the bassinet and proximity to the lavatory may be bothersome. 5 J None No Power Seat 5 J is a standard Business seat, however, the proximity to the lavatory may be bothersome. 5 K None No Power Seat 5 K is a standard Business seat, however, the proximity to the lavatory may be bothersome. 6 A None No Power Seat 6 A is a standard Business seat that is missing a window. 6 B None No Power Seat 6 B is a standard Business seat. 6 E None No Power Seat 6 E is a standard Business seat. 6 J None No Power Seat 6 J is a standard Business seat. 6 K None No Power Seat 6 K is a standard Business seat that is missing a window. 7 B None No Power Seat 7 B is a standard Business seat. 7 J None No Power Seat 7 J is a standard Business seat. 7 K None No Power Seat 7 K is a standard Business seat. Air France offers a variety of inflight audio programming on this aircraft. Every seat on this aircraft has a personal entertainment system with a variety of video and audio options. 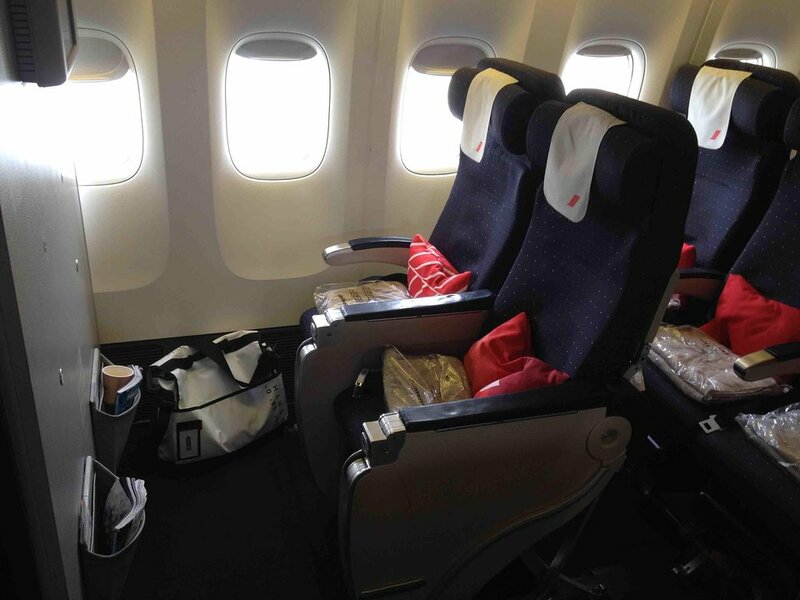 Most window seats have an equipment box beneath which obstructs leg and storage room. All Business and Premium Economy class seats have 110V power ports. There is no inflight power in Economy. The Air France Airbus A330-200 is used on a variety of long haul services. This version of the A330-200 features three classes of service: Business, Premium Economy, and Economy class. In Economy class, seats A,D,G, and K seat have limited underseat leg and storage space due to the presence of an entertainment equipment box. Quiet seat. All was fine. Screen works fine. I was travelling from Bangalore to Paris with this flight. I chose 39F as my seat, it was the bad decision which i bad. no space for leg since it has some box in front, very less space for legs. TV screen display is very old and pathetic. Whenever i touch or shake my armrest it used to get on, which irked me while sleeping. flight is very noisy and couldnt able to sleep properly. Got very bad head ache in the flight. from my next travel i would not prefer this flight. This was an older plane with less than comfortable seating. The seat-back video system was largely inoperable. The cabin crew seemed apathetic but otherwise responsive if you had requests. Very disappointing business class. My first thought was "how old is this plane"? The entertainment equipment is from another era -- slow, small screen and difficult to use. Even the food on this flight was less than Air France standard. Will probably try to avoid Air France in the future which is a shame because it used to be one of my favorite airlines. This bulkhead premium economy seat has significant extra legroom. The extra width of the seat and armrest is worth the extra fare. The tray table is small and unfolds in a awkward position compared to the non-bulkhead premium economy seats. As noted in other comments, there is essentially no recline in the premium economy seats. Whoever designed these seat should be found...and sternly spoken to. The business class in this plane is very disappointing. It's very dated - no lay flat seats - and quite dingy and badly in need of not just an update, but some basic serious cleaning. You'd only choose to fly on this plane if you had no other choice, and there are a lot of better choices out there. Plus the cabin service for Air France leaves a lot to be desired. I upgraded at last second to premium economy on this Houston to Paris nonstop. I would never again purchase premium economy for this type plane. It felt like there was very little cushion in the seat. I took my personal blanket that I normally place in the small of my back and I sat on it to provide more cushion. I can normally sleep on long flights but not this time. It just didn't seem to provide much more room. Maybe the seat was so hard that it just spoiled what was supposed to be the advantage to being in premium economy. Ug. One of the older planes you will fly on. Seats falling apart, many of video screens do not work. Seats 29 A & B coldest seats on coldest plane, according to flight attendants. Elderly parents both fell sick after flying. 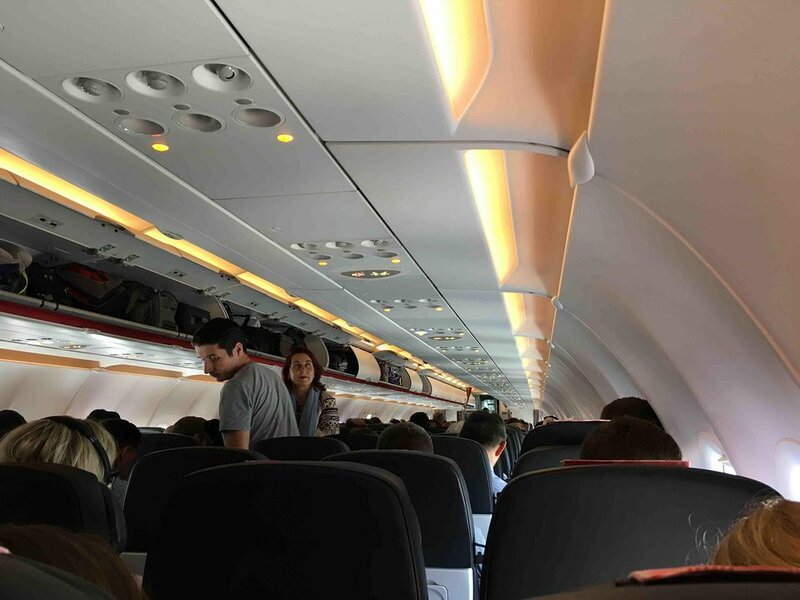 My own trip April 2018 on AF 144 was delayed due to a cargo door malfunction. Air France, we expect better. Loads of legroom but if you are on the lardy side the fold out table may not fold out. The seats looked worn and fittings were broken also my recline didn't function at all. Screens fold out of the arm rest but the picture isn't great. The cabin is a bit tired, very much in need of an overhaul, but that goes for the entire plane! I usually pick this seat as it is the front-most seat which is FOC but it does have a power pack in the foot well. 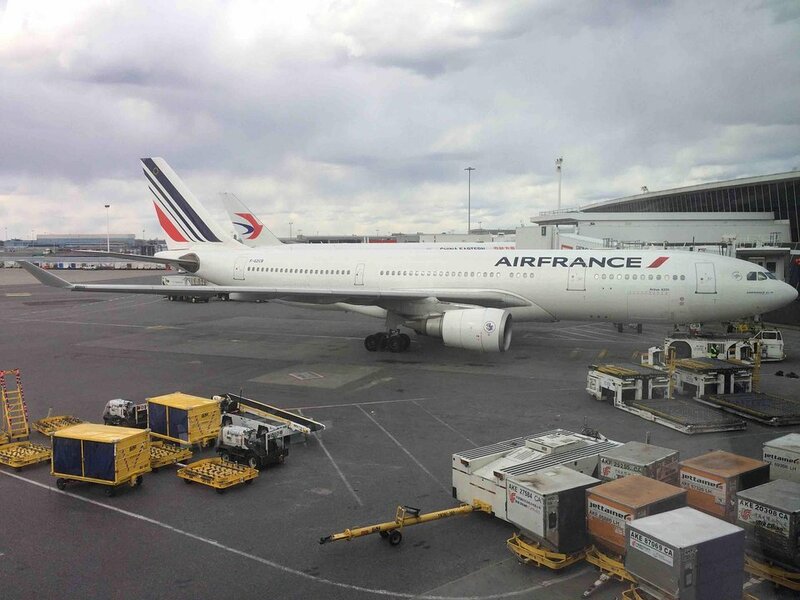 Flew on this plane Cape Town to Paris (11hrs) in Business, seats were comfortable enough, says angle flat bed, but in relevance with the foot rest which angles downward slightly, the bed goes very flat but at the odd angle. IFE had decent enough selection but was a bit slow, food was amazing, overall, a fairly good seat for 5-9 hours. Air France Premium Economy seats on this plane are atrocious. Dirty, creaky, and the "recline" function is a back-killer. Compared to say Lufthansa product, these seats are terrible. Also, no self-serve area for drinks etc. as sold on AF site. Very much dated aircraft interior, arm rest for 42B was broken. Tiny screens, feels like travelling in the early 2000s. Flight was not full so that made up for the lack of amenities. IF the flight was full it would have been challenging. Crew was polite, so that was a plus. Not my prefered travel with Air France. Seat 28K is not convenient due to the proximity of the lavatories (lights, smell, noise, traffic) but also due to the entertainment box under the front seat preventing to strech my legs properly (only 50% available). Definitively not a seat to choose. Seat was very hard and only reclined about 1 inch. Dinner was served at 11:00 pm. What's the point? I had to wake up to eat. And breakfast at 2:00 am - Seriously! Air France Airbus A330 economy class is a like a bunch of wooden boxes. No wiggle room at all and the seat cushions are so hard I had to put a pillow under my you know what.. Who had this sick idea of putting hard partitions between the seats? I've had an exit row seat but it only added more room in front of me. The seat, just like all other seats in economy class, was horrible. Air France - you need to make this plane a lot more comfortable. I've only flown 8 hours, Paris to Chicago. I couldn't imagine flying 12, or 15 hours. That would unbearable. Front area is very quiet, almost no foot traffic. Service and food was excellent. 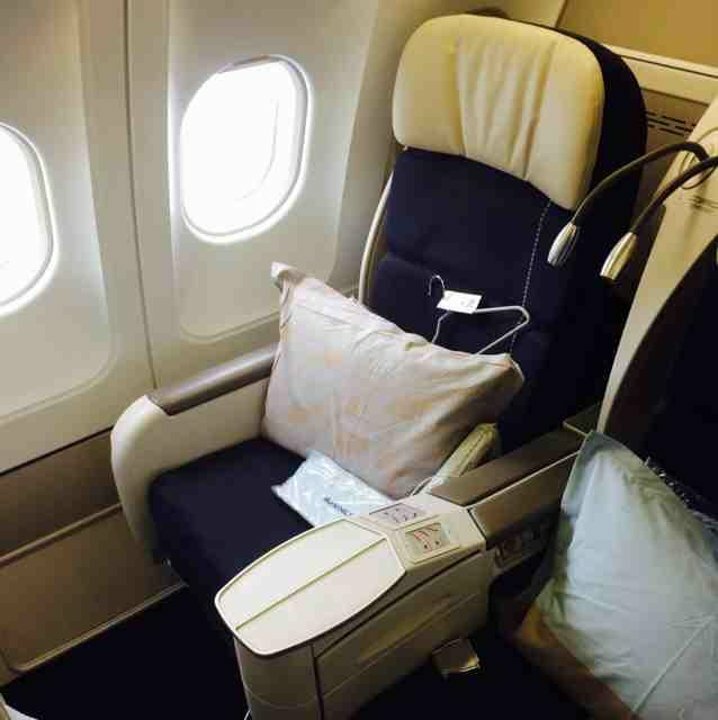 Even though the seat is not completely flat it was comfortable and I slept well. The seat meets a padded shelf in the seat ahead, like an ottoman. Nice to put your feet up while seated during the flight. But that area is too small to sleep on your back - not enough height for feet. Lots of storage - on the ottoman, under it, and even under your own seat and it does not get crushed by the recliner. Would definitely fly it again. Especially bad on night flight. Being next to the toilets, the lights are on infront of toilets, plus constant use of toilets. Unable to sleep. Seats 1J & 1K have the bulkhead in front quite close and therefore lesser legroom. For taller travelers inconvenient. To get out from the windowseat one will always disturb the traveler in the aisle seat. Flew on this aircraft to/from Caracas. 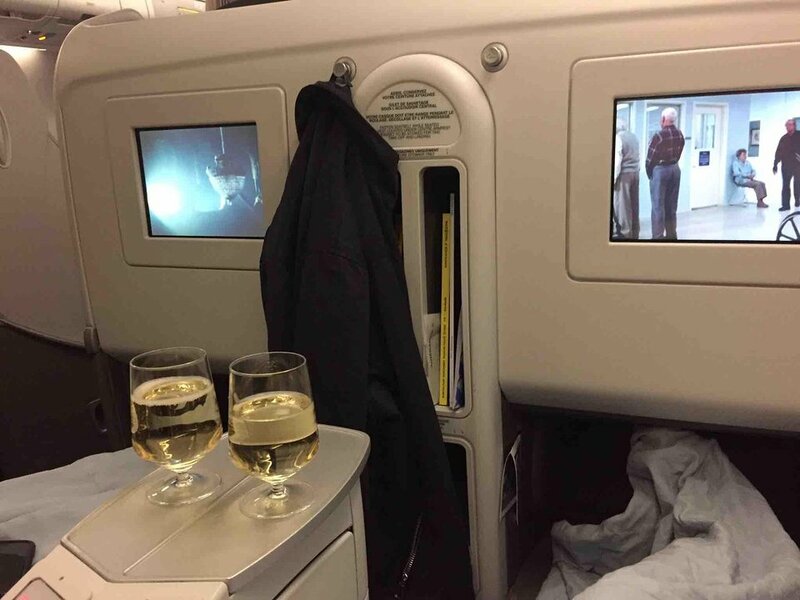 Very poor that AF do not have fully flat seat in J class on a 10 hour flight. I'm 6'3" tall. I found seat 2A on outbound leg, much more comfortable than seat 4E on return. There is a gap between bottom of seat and the footrest which was uncomfortable when trying to sleep. I also found position/maneuverability of IFE screen much better in seat 2A. If tall, bulkhead seats are definitely the ones to go for. This was a very nice seat. I was upgraded from economy plus. It lies almost flat and has isle access. Food was good, amenities were nice and private bathrooms for business class were so clean! Seat 1E is a bulkhead seat, so there is no stowage on the floor in front. The crew cabinets on the left can be busy during the night, creating a mild distraction. Seat 29A has extra legroom on the Air France A330 between Paris and New Delhi. If you are tall (I am 6'2"), this would be a very good seat. This is a Preferred Seat and I paid $68 for this seat. It is worth the money. The service was good, but not as great as the Air France A380. The inflight entertainment (IFE) system in Economy class on this aircraft is quite antiquated and makes for a less-than-satisfying experience. The screen size is VERY small, the systems are VERY old, the touchscreens are functional, but not very responsive. Heavy traffic from forward boarding door. Crew equipment closets next to 1E were distracting. Seats may have a 32" pitch and 18" width but the seats are not as comfortable as Delta on their A330-300. The seat width is somewhat misleading because the arm-rests are very wide and go up only by an angle of about 80%. Thus, the seat width is compromised when the arm-rest is down/horizontal but when pushed back this compromises shoulder-room. Overall, cramped seats further restricted by the IFE in front of seat 39F. Air France flies 1 versions of Airbus A330-200.